Children are being urged to take part in this year’s free Summer Reading Challenge. This year’s challenge, which launched on Saturday, July 14, is Mischief Makers, celebrating the 80th anniversary of the Beano comic. To take part, all children need to do is to head to their local library where they will be given a colourful collector’s map of Beanotown to keep a record of their reading journey. 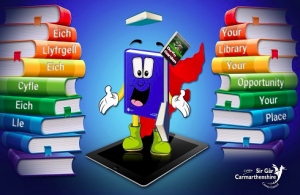 Visit Ammanford, Carmarthen or Llanelli town libraries along with any of the 15 local community libraries and the three mobile library vans in Carmarthenshire, to be able to enter a competition for the most read books over the summer to win a family ticket to a Pantomime near you. As children read at least six library books over the summer, they will collect stickers which will help them crack the clues and help Dennis, Gnasher and friends find the buried treasure! For pre-schoolers there is a mini-challenge while young people (aged 13 to 24) can volunteer and support younger children taking part, as part of The Reading Agency’s Reading Hack programme. To take part in this free event, all your child has to do is sign up at the library where they will be given a collector poster to keep a record of their Summer Reading Challenge journey. As they read their books, each child will receive special sticker, games, wristband and much more. For more information on the Summer Reading Challenge including how to get involved contact your local library.